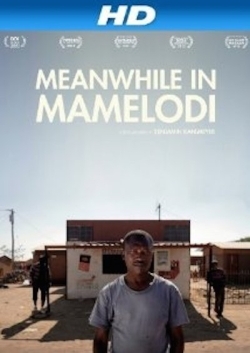 Set against the raucous backdrop of the 2010 World Cup, MEANWHILE IN MAMELODI is a beautifully crafted portrait of a place and one family’s daily life inside it. The Mtsweni family lives in the Pretoria Township of the title, in the district known as Extension 11. Their world is a ramshackle collection of corrugated tin dwellings and makeshift shops, open sewers littered with debris and red-earth rectangles filled with soccer-playing children and teens. Seventeen-year-old Mosquito is one of those kids. As she studies for math tests, flirts with boys and shops with her best friend, her father Steven prepares his “tuck shop” for the promise of cash-flush tourists. Meanwhile, his wife struggles with mental illness. The Mtswenis’ lives unfold as the Cup brings new hope to the ravaged town. Extension 11 buzzes with the drone of vuvuzelas, signaling a new South Africa has arrived. Despite the poverty around her, Mosquito insists this is not her parents’ country. She is the face of South Africa’s future – part of “a new generation free to do all things.” A colourful documentary, illustrating a potent hope emerging from the rubble.